Bestow on us, we pray, O Lord, the wisdom and strength of the Cross, with which you were pleased to endow Saint Rita, so that, suffering in every tribulation with Christ, we may participate ever more deeply in his Paschal Mystery. Who lives and reigns with you in the unity of the Holy Spirit, one God, for ever and ever. St. Rita of Cascia | Rev. Vincent F. Kienberger O.P. 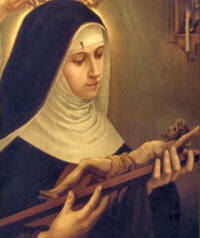 After eighteen years of married life, St. Rita lost, by death, her husband and her two sons. Called afterwards to the religious state, she professed the Rule of St. Augustine at Cascia her native town, in central Italy. In a life-long and terrible malady her patience, cheerfulness, and union by prayer with almighty God, never failed her. Jesus imprinted on her brow the mark of a thorn from His crown. She died May 22, 1456, and both in life and after death has worked many miracles. This optional memorial is new to the USA liturgical calendar. Rita's childhood was one of happiness to her parents. To satisfy her desire of a life of union with God by prayer, her parents fitted up a little room in their home as an oratory, where she spent all her spare moments. At the age of twelve, however, she desired to consecrate herself to God in the religious state. Pious though her parents were, their tearful pleadings to postpone her noble purpose prevailed on Rita, and they gave her in marriage, at the age of eighteen, to an impulsive, irascible young man, who was well fitted to try the patience and virtue of the holy girl. Two sons were born to them, each inheriting their father's quarrelsome temperament. Rita continued her accustomed devotions, and her sanctity and prayers finally won her husband's heart so that he willingly consented that she continue her acts of devotion. Eighteen years had elapsed since her marriage, when her husband was murdered by an old enemy; both of her sons died shortly after. Rita's former desire to consecrate herself to God again took possession of her. Three times she sought admittance among the Augustinian Nuns in Cascia, but her request was refused each time, and she returned to her home in Rocca Porrena. God Himself, however, supported her cause. One night as Rita was praying earnestly in her humble home she heard herself called by name, while someone knocked at the door. In a miraculous way she was conducted to the monastic enclosure, no entrance having been opened. Astonished at the miracle, the Nuns received Rita, and soon enrolled her among their number. St. Rita's hidden, simple life in religion was distinguished by obedience and charity; she performed many extreme penances. After hearing a sermon on the Passion of Christ she returned to her cell; kneeling before her crucifix, she implored: "Let me, my Jesus share in Thy suffering, at least of one of Thy thorns". Her prayer was answered. Suddenly one of the thorns detached and fastened itself in her forehead so deeply that she could not remove it. The wound became worse, and gangrene set in. Because of the foul odor emanating from the wound, she was denied the companionship of the other Sisters, and this for fifteen years. As St. Rita was dying, she requested a relative to bring her a rose from her old home at Rocca Porrena. Although it was not the season for roses, the relative went and found a rose in full bloom. For this reason roses are blessed in the Saint's honor. After St. Rita's death, in 1457, her face became beautifully radiant, while the odor from her wound was as fragrant as that of the roses she loved so much. The sweet odor spread through the convent and into the church, where it has continued ever since. Her body has remained incorrupt to this day; the face is beautiful and well preserved. — Excerpted from Heavenly Friends, Rosalie Marie Levy. Symbols: Nun holding a crown of thorns; nun holding roses; nun holding roses and figs; nun with a wound on her forehead. From the Catholic Culture library: St. Rita of Cascia and A Life of Heroic Humility and Obedience.